“People will stare. Make it worth their while”- Harry Winston. ‘Anything to look hot’ serves beauty, glamour and the secrets- hot on the platter. 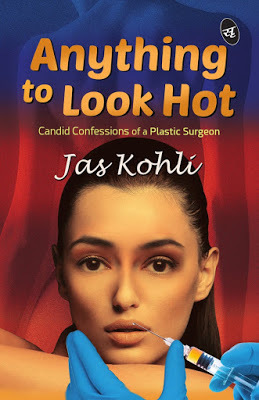 The book is an episode from one phase of the life of a plastic surgeon when he was at his career peak. Dr Dhruv is passionate about his job but the knick-knacks of daily life try to make him quit. On one side is his career and on the other side is the temptation of getting involved with the ravishing beauties of the glamour world. Will Dr Dhruv make his way out successfully and be able to bring the house down? Or will his health issue and other problems surpass his desire to become a successful surgeon? The book discloses the secrets of those who can do anything to look hot. Grab your copies today! If the words you spoke appeared on your skin, would you still be beautiful? “Anything to look hot” answers this question perfectly. The book explores the cobweb of celeb world and throws light on what it takes to subsist oneself. Often we, the ordinary people, hold sceptical views on how beautiful these celebrities can be! But somewhere deep in our subconscious mind we know- all that glitters is not gold! The author has brought forth the strident reality behind all those good looks and the mastermind behind it. The title of the book, although initially sounded boring, is relevant to the content. The cover could have been better. The print quality and the typesetting are fine. The concept of the book is new and can have mixed reviews. The narration is simple and easy to comprehend. Some chapters are stretched just for the sake of adding words and simultaneously the use of incomplete sentences makes the reading wobbly. Secondly, the blurb of the book seemed a little off track. Overall, it is indeed a great effort by the author! **This is one of the books in which the editing and proofreading have actually been done- kudos Srishti Publishers.